This must be a really good roast idea because I had every intention of listing this as a new recipe when I found I’ve posted almost the same thing before. I still will proceed since I have everything documented. 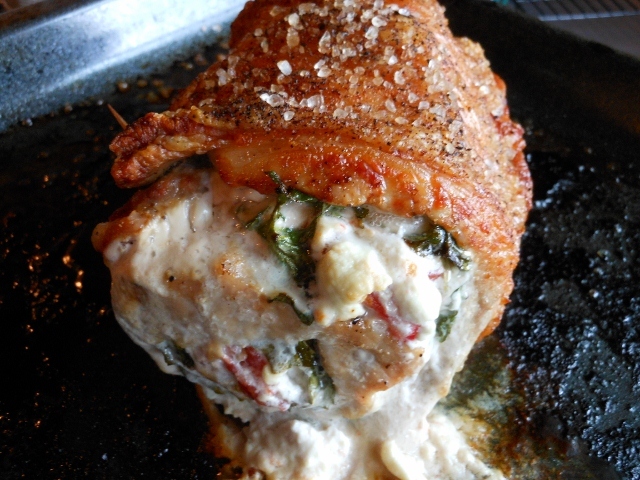 I made a couple of slight changes from my original stuffed pork loin post. Both however were delicious. This time I omitted the bacon and fresh garlic and used a smaller piece of pork so it cooked faster; I also added some fresh diced tomato from my garden! 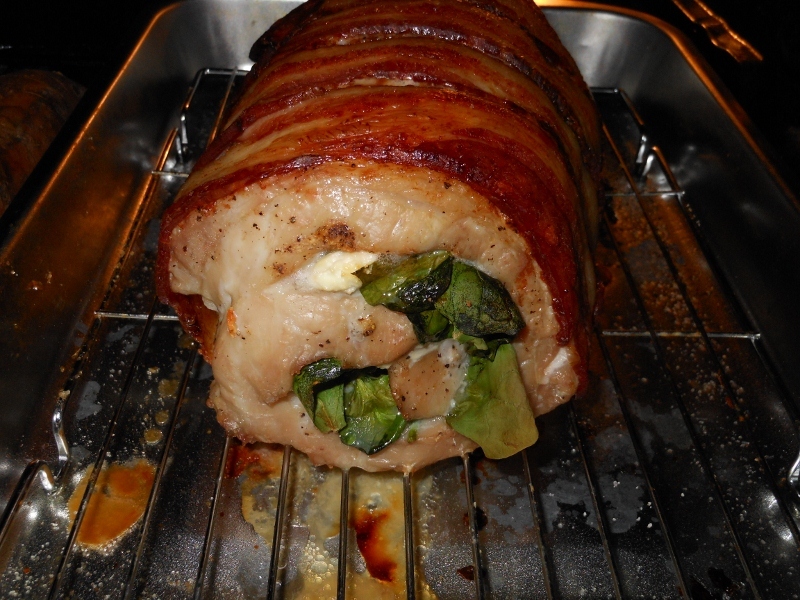 I like to unroll my pork; it’s just fun. 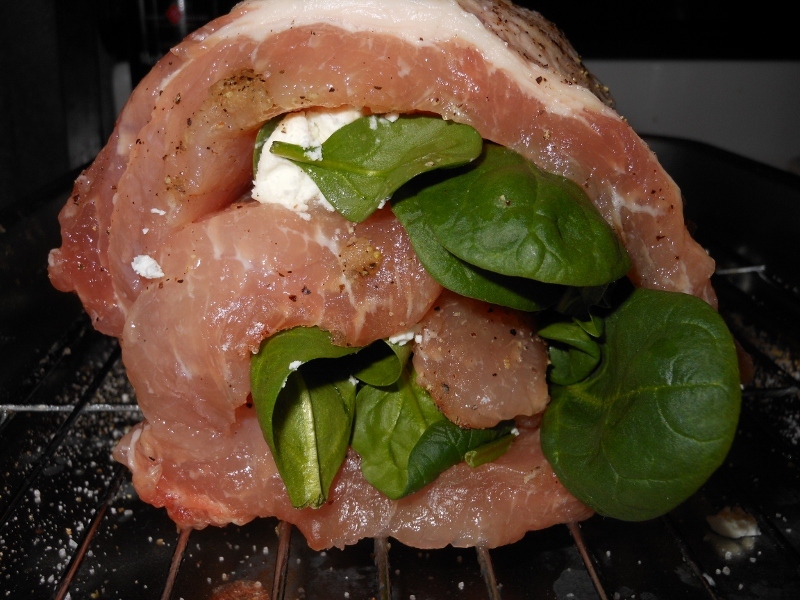 You could alternately do an accordion style cut but I like to start at the top and work my way around the pork trying to maintain a 1/4 inch thickness as I go. It doesn’t really matter if it’s thicker or thinner in places; you can’t see it in the picture but I actually have a couple of holes in mine. You can pound it to an even thickness if you desire, but once it is rolled back up it doesn’t effect the cook time to have varying thicknesses as it all again becomes one roast. 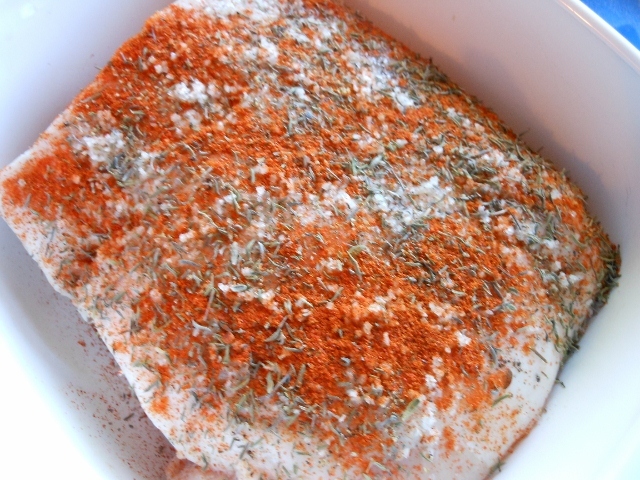 I next seasoned the 2 pound pork roast with salt, pepper, and garlic powder. I would estimate I used 2 o.z. spinach, 2 o.z. 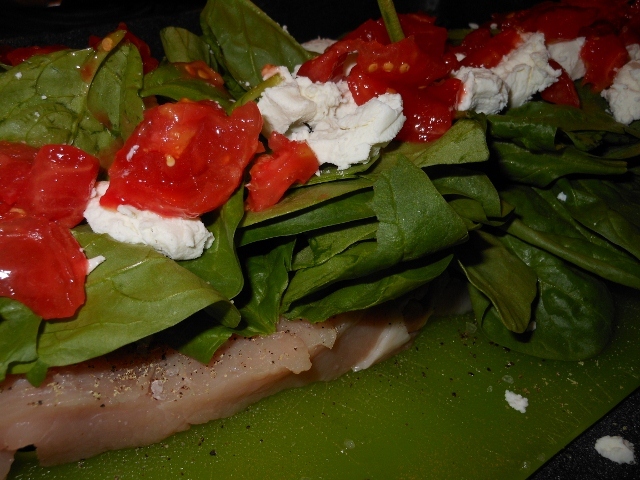 goat cheese, and 1 tomato peeled and diced; layer this on the pork roast. Roll back up and secure with toothpicks or tie with baking twine (I used 2 toothpicks). 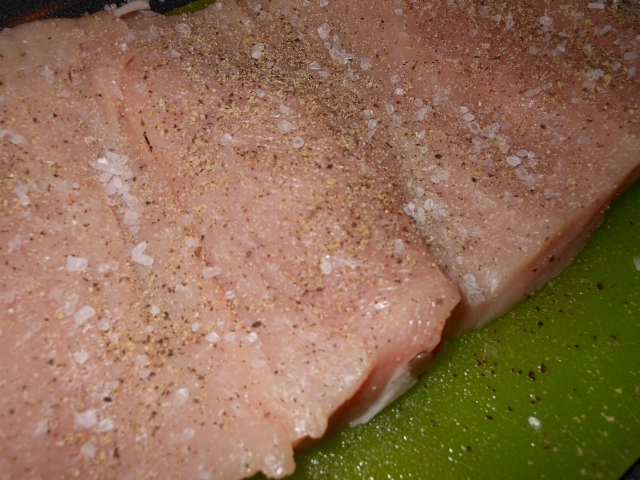 Sprinkle with salt and pepper and bake at 375 degrees for about 1 hour for a 2 pound roast; adjust time as needed depending on size. Allow to rest for 5 minutes before carving. 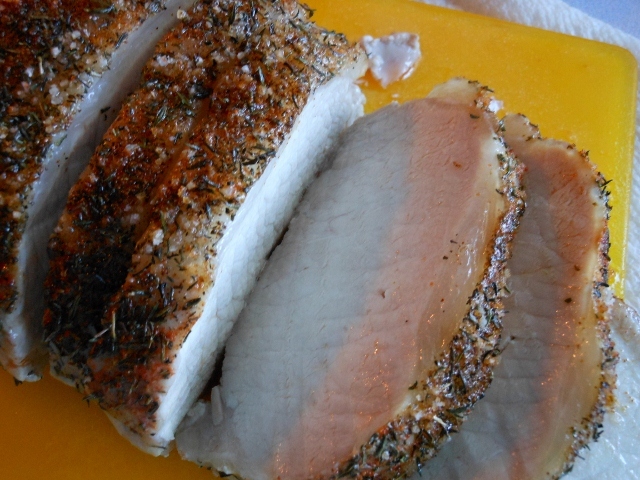 I opted for a simple roasted pork loin this evening. Sometimes the simple dinners are the most delicious. I purchased a 6 pound pork loin on sale at the grocery today and cut about a third of it off for the roast so I had 2 pounds to work with. I’ll use the rest for some other recipes this week, but I didn’t want to roast it all tonight. 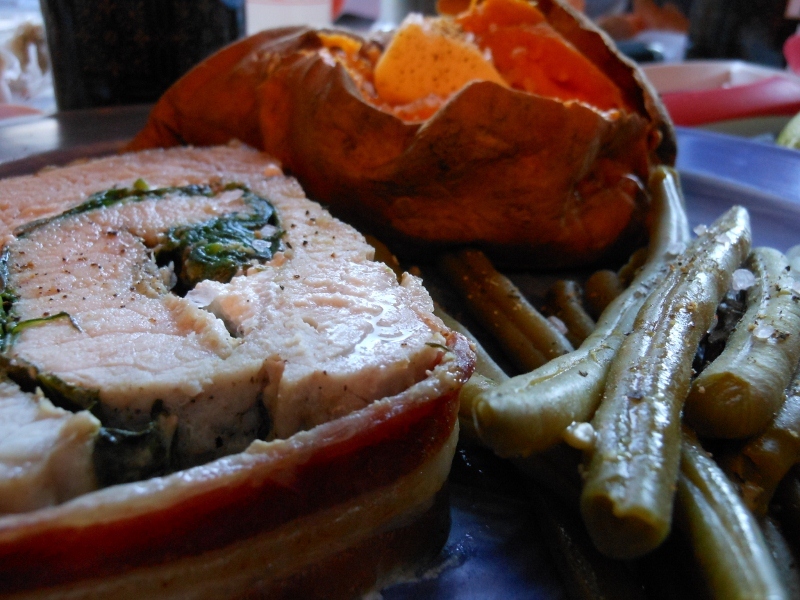 Season pork and bake at 325 degrees for about an hour. Remove from oven and cover with foil. 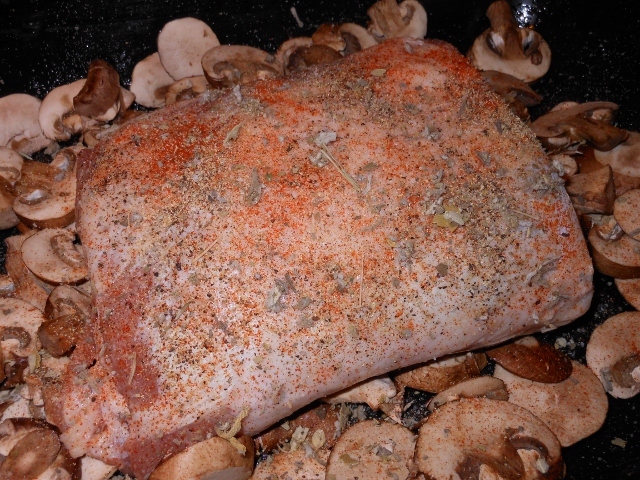 Allow to rest 10 minutes before carving. I posted the teaser to this delight a couple of days ago. Here’s the break down of how Charles made it. 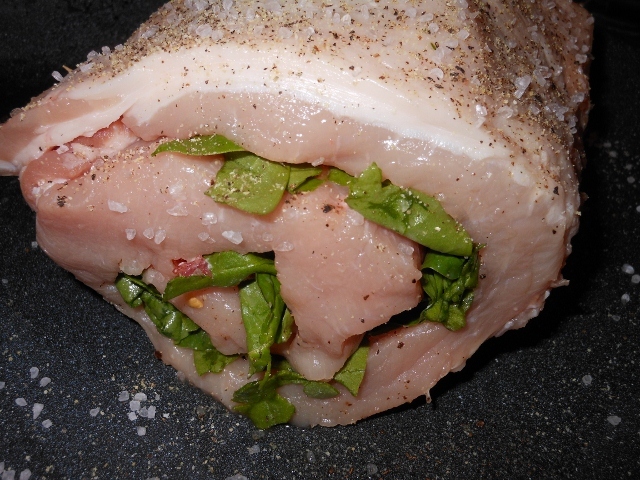 The most difficult and time-consuming part of making a stuffed pork loin is cutting the meat to unroll. I’ve seen several techniques but unrolling is my favorite. Don’t worry if it isn’t perfect. It isn’t going to show once you are done and if you end up with it too thick in places you could always pound it out to a more even thickness. If you get it too thin just overlap again or make extra rolls when you wrap it back up. The important part is to try not to cut all the way through as you go; just make your initial cut and keep rolling the remainder of the roast away from you as you continue. About a half-inch thick is a nice size. You will definitely want a good sharp long knife for this. 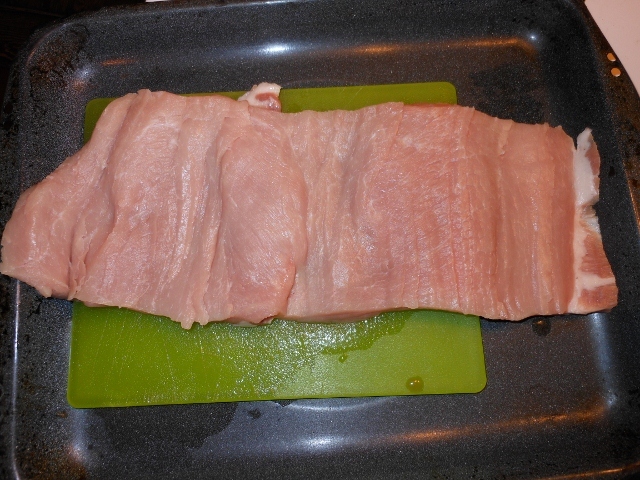 Begin by cutting roast to unroll. Season one side of roast with garlic, salt and pepper. 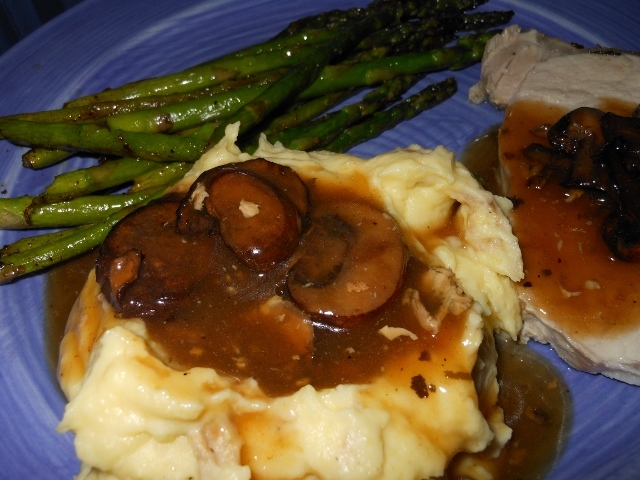 We did this the day before and allowed to rest overnight in refrigerator ~ this allowed the garlic flavor to penetrate throughout the roast. 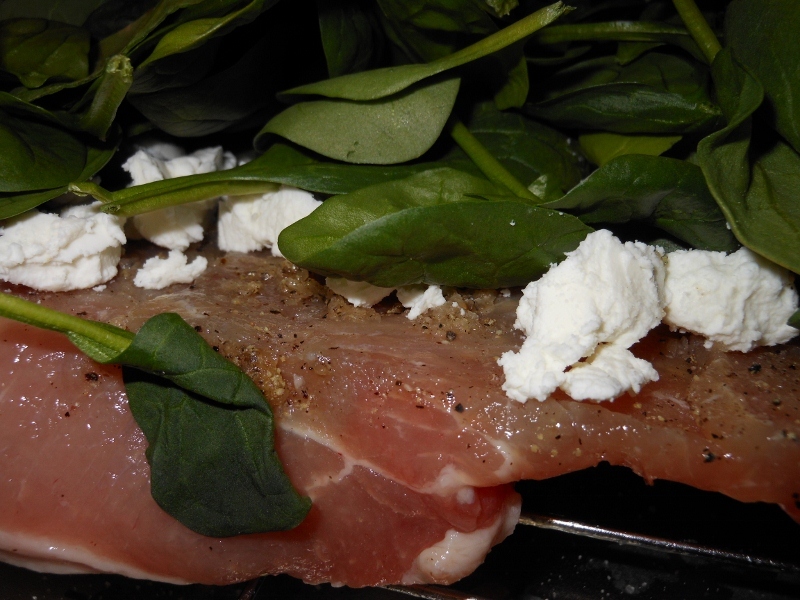 The next day top with goat cheese and spinach. 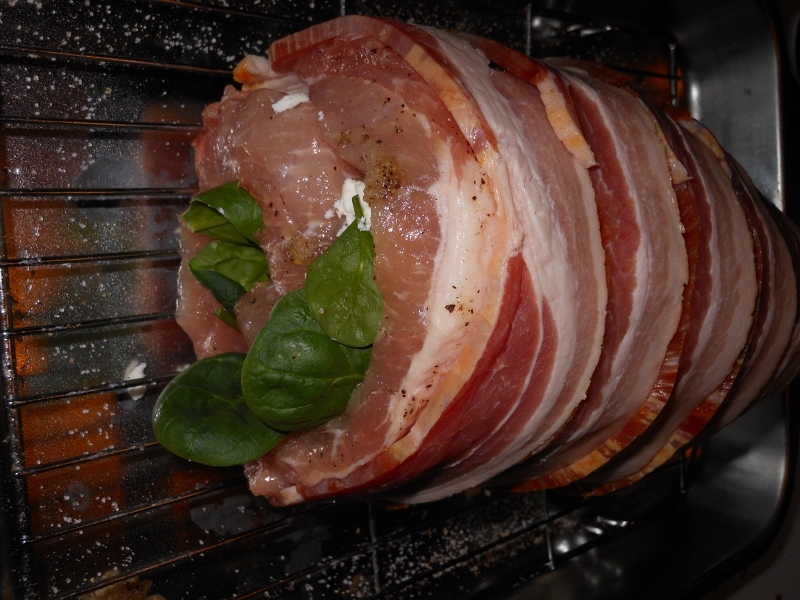 Lay bacon across top of roast tucking ends under roast to secure. Bake at 375 degrees for about 1 3/4 hours. Check temperature (160 degrees is recommended temp for pork). Allow to rest for at least 5 minutes before carving. As far as filling go with your favorite flavors. 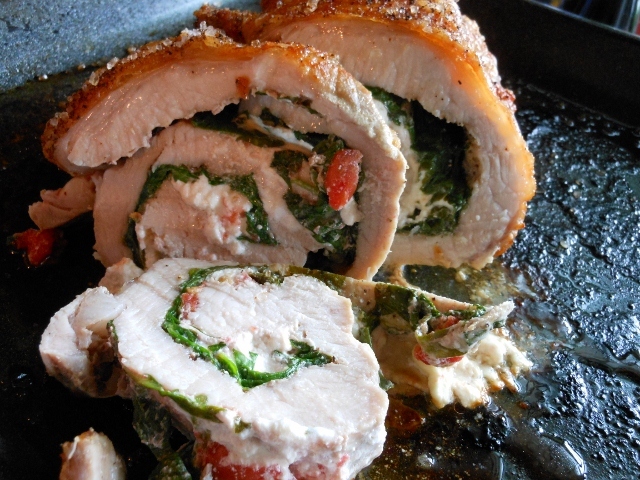 We used goat cheese and spinach this time. Mozzarella and parmesan are other great cheese choices. sun-dried tomatoes make a nice addition. If you prefer something on the sweeter side use an apple pie type filling. My goal for the year is to post every day. So far so good. In fact I actually started this blog in December. Of course someday’s it will appear that I’ve skipped a day or posted twice in one day; midnight creeps up fast some times and while I’m editing the day changes. Anyway ~ today was super busy ~ in fact one of the busiest days the restaurant I manage has experienced in quite a long while! We served about 3 times the expected crowd; and we were expecting to be busy. I didn’t stop running for at least 5 hours. Thankfully I had a fantastic lunch to get me through! 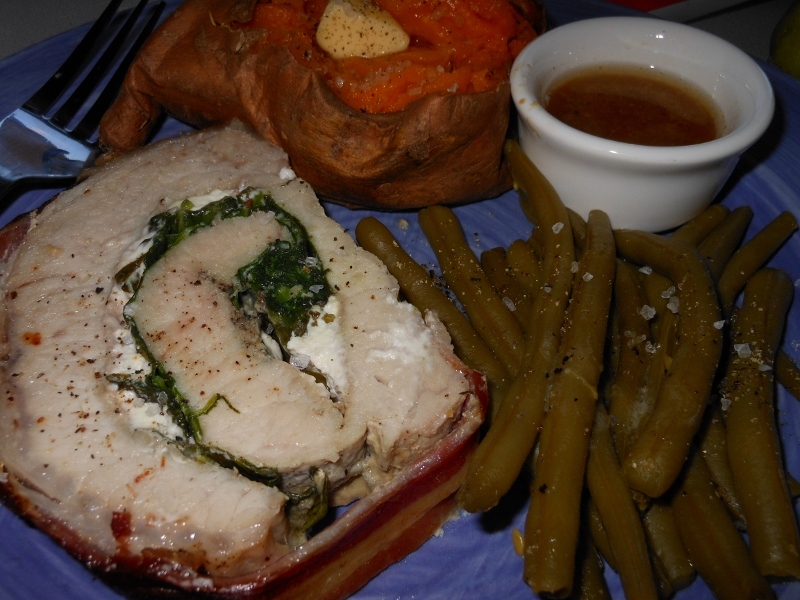 Charles made stuffed pork loin wrapped in bacon and baked sweet potatoes. I love my baked sweet potato with butter, pepper, and coarse salt. 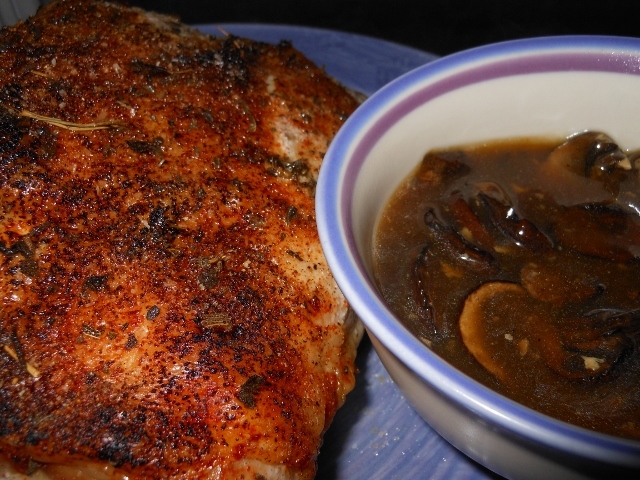 If you haven’t tried this savory approach you should. I’d always been offered them with sugar and cinnamon butters but I much prefer this version.